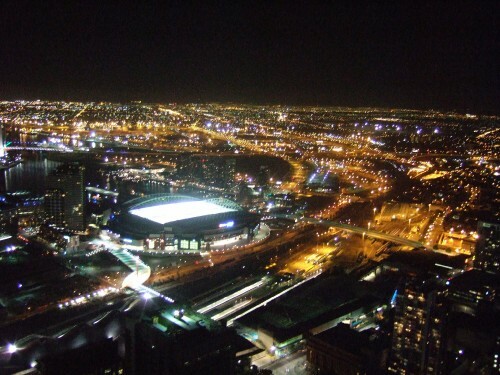 03/11/2009 - We arrived in Melbourne in the early hours on the morning. We both didnt managed to get much sleep much on the flight. I watched the film 'Up' and it made me cry!! i dont even know why lol and tom watch 'Pelham 123'. It was very overcast when we landed. We got in a cab and asked him to take us to St Kilda Road in St kilda as that was the address we were given for the hostel. After about half an hour we had gone past the city and were heading for the outskirts, the driver was going back and forth on 'St Kilda' road and kept asking us the name and number of the hostel. He gave up looking and said that he had no idea where it was and said he had to drop us off here and we would have to find it ourselves. We were on st kilda road so figured it couldnt be far. When we got out the cab we noticed that there was a police station further down the road so we went in there to ask for some help. We told them what had happened and they looked really sorry for us, apparently this sort of thing happened all the time because st kilda road went all the way from west melbourne to st kilda and therefore the numbers started again thats why he couldnt find 333 st kilda road as we were still in west melbourne! They told us we had to get a tram to st kilda that would take us where we needed to go. So we went back down the street and luckily the tram number we needed came first. We had to buy a ticket on the tram but we had no idea what ticket we needed so we just stood there lost lol a nice young aussie girl could obviously see we were a bit lost so she asked me if we were ok and i told her we need a ticket but had no idea which one to get, so she showed us. The tram stopped right outside our hostel and we were so glad to finally get there. We checked in at reception but had to wait until lunchtime to get into the room so we feel asleep on the sofas until they woke us up. 06/11/2009 - For the past few days we have just been exploring the city, we went on a free tour with the hostel and jumped on the free bus that takes you around the whole city. In the mroning i woke up really early as i had planned to skype my friends but that went wrong as i had the time difference wrong so coul have stayed in bed for an extra hour or so. But we were going on the neighbours tour so it didnt matter. A big bus with neighbours all over the outside pulled up an the hostel and tom said that he would not get in it, but he had no choice!! It was a forty minute drive from the city to 'Ramsey' street, and on the way there the cray driver that knew absolutely everything there was to know about neighbours put on some of her old favourite episodes. Our first stop in Erinsborough was at the school but we couldnt go in as it is an actual school so would look a bit weird. We then went to the real 'Ramsey Street' which was a lot smaller that it looks on tv. All the houses had perfect gardens and were really clean. We were only there a fes minutes when the driver told us we had to leave if we wanted to meet one of the stars. So we got back on the bus and went to the studio. When we got there we stopped at stephs garage and was having a look around when Lucas appeared (those of you that dont watch it will have no idea). Tom had no idea who he was and kept asking me really load in front of everyone. He talked to us for a while then we all had a picture taken with him, tom had one even though he still had no idea who he was. Tom was hoping it was going to be Dr. Karl or Harold that we got to meet. After that we went back to Ramsey street to take photos of the houses and with the ramsey street sign. People leave in each of the houses and they have people comign to look at them 24/7 so they have got security men that are there everyday as well to help keep them safe. You are not aloud to go on the grass or in their front gardens and if any of them want to redecorate or change the appearance of their house in anyway they have to tell the directors first so that they can write it into the script! 08/11/2009 - Yesteday we managed to upload 2 memory cards full of photos which took forever! As its our last day in Melbourne we decided to have a picnic on the beach. So we went to that supermarket and got some goodies then went down there. By the time we got there some freak heatwave hit and it was boiling an d neither of us had a swim stuff on us. We sat on the beach for about half an hour but we were so hot we had to go to the park on the seafront and sit in the shade. We found a nice little spot and had our picnic and played some cards. We chilled out there most of the day then went back to that hostel for pizza and dvd night. It was some weird film they put on that was about some english man that just couldnt get a girlfriend!